Patience is a virtue. I should have waited for the waterproof version of this to come out, which has already happened. Of course, I have my excuse for buying another mascara with regular formula. My excuse consists of equal parts of hope, curiosity and sale. I have pretty much given up on non-waterproof mascaras because every single one of them uncurls my curled lashes right away, but I still have a faint hope to find one that keeps my curls intact yet washes off easily. Plus there are so many good things said about this new mascara with the cutest name and packaging. Finally, you cave in if there is a 40% off sale going on. So there, you have it - my threefold academic excuse. 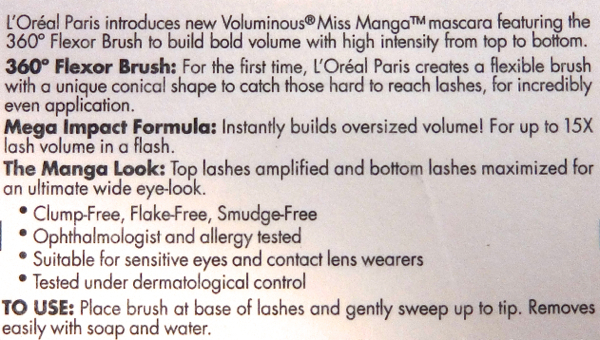 I hate to tell you that L'Oreal Voluminous Miss Manga is another mascara that bites the dust, although it may not be a total loss. This is what Miss Manga would do for you if you have naturally curly lashes. I really like the shape of the brush. The wand is indeed very flexible so it is easy to work with, and the angled bristles with different lengths do seem to work to quickly add dramatic volume to the lashes. The triangular shape reminds me of Lancôme Hypnôse Star and the result is similar, too. I love the intense black color of the Blackest Black shade I chose. I did not experience any smudging or flaking. However, it is not entirely clump-free. Let's get real. All volumizing mascaras are at least a little bit clumpy. I would say this mascara is "relatively" clump-free for a volumizing mascara. The given look is not natural in any way, which is fine by me since it is a mascara that is supposed to give you the "manga" effect. I just wish, really really wish, it kept the curls of my eyelashes as they were curled. This is what I get - somewhat volumized flat lashes. L'Oreal Voluminous Miss Manga is not a total disaster for me. If I add this on top of a mediocre defining waterproof mascara (you might be surprised to hear it is the Giorgio Armani Eyes To Kill, which, by the way, wouldn't be able to kill anything, only that I should kill the mascara for being mediocre despite of its $32 price tag), I end up with unnaturally huge yet very pretty lashes. 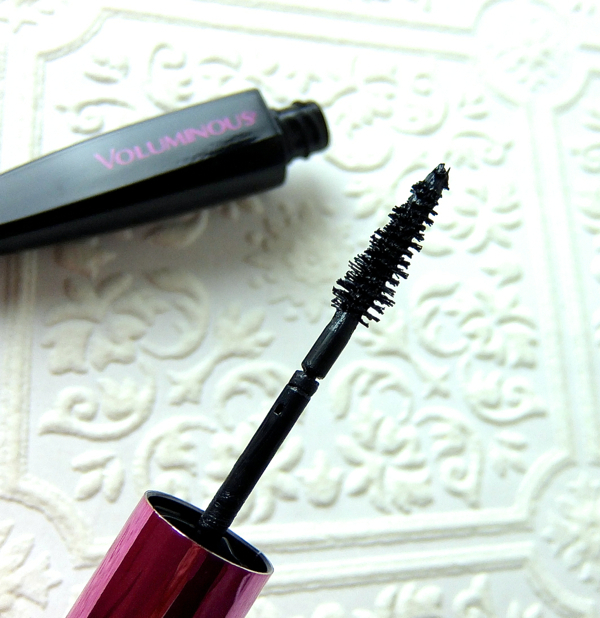 I can still see why many other girls are raving about L'Oreal Voluminous Miss Manga Mascara, and I hope I would get better results with the waterproof formula. 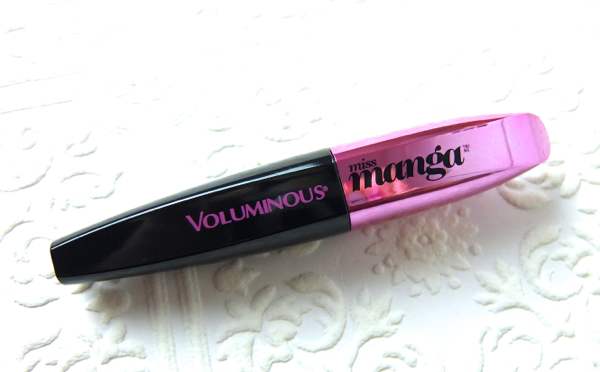 Have you tried L'Oreal Voluminous Miss Manga Mascara? Do you have any issue with non-waterproof mascara formulas like I do? Ooh! Funny I just logged in to write a review about this and yours popped up ;p I bought the waterproof version and it holds my curl but it doesnt give me enough volume.. it works better as a base coat for my maybelline rocket volum mascara actually, so I've been wearing it with that! I actually dislike the brush although it is fun to use.. I will look forward to your review on the wp version, Michelle! Awww, that's too bad it doesn't hold your curl! I haven't tried this yet, but I want to! I don't usually have smudging problem with mascara regardless of the formula. Some say wp version smudge even more on oily skin, which makes sense. It does give you big lashes! Sorry this didn't work out to be amazing for you too! I always rely on japanese brands for my HG volumizing, curling and waterproof mascara! I can see that it's given you volume but the curl has been reversed! I always buy waterproof formulas no matter what, I can't risk it not working for my lashes! Haha, sold out? Well, it is pretty good for what it is. I've splurged on high end mascaras recently, but I am about to conclude that ds mascaras are as good if not better. The GA ETK is a huge disappointment, for example. Aww, too bad this didn't work out for you :( Personally, I love this mascara, but I do have a natural curl to my lashes to I can't contribute to whether or not it holds the curl. However, it does do great things for me when it comes to volume and I don't have any trouble with flaking of smudging. Really curious to see what you think about the waterproof formula! I agree with you... I don't think it's too bad. The color is pretty nice. The thing is that I usually like it when my lashed look REALLY long and with a lot of volume. I Also don't like clumps. I hate them! I just started following you on Bloglovin, Twitter, GFC and Facebook! I really liked your blog and makeup tips and would love for us to stay in touch:D! If you also have an Instagram account we could follow each other there too:D! I hope you come by my blog sometime and like it too. LOL. Glad to help you there! I have to wear tubing mascaras; I use an emollient eye cream so wp versions smudge like nuts, and then I wear contacts and my eyes tear sometimes so non-wp formulas also don't work, LOL. So there's not a lot of options out there for me, but thankfully I do like my HG a lot (Clinique High Impact Curling mascara). Mascara is frustrating, isn't it? So many things! Curling, smudging, volume, length...ugh. I am lucky in the lash department in the sense I have decent length and volume on my own, I just need a mascara to darken and add a little extra umph. This one seemed interesting, maybe it's just because I'm on an anime kick and cute advertising gets me every time. I like what it did accomplish on you (sans curling) I wonder if mascara is just always going to be better to layer a couple of kinds and that's how it is. I just wish I could find a decent non-wp one so I can rotate, because wp mascaras are pretty harsh on my lashes. I've heard nothing but meh things about this mascara, and I'm glad I read your review before taking the plunge. I've been reading a lot of raves about this recently, so thank you for this review! Mascaras that drop a curl like this one are a total no-no for me, so I'm glad I didn't have to test this one myself to find out. I still want to try the wp version, isn't it crazy??! I usually don't mind a little clumping cause I think that's how a mascara works to volumize quickly.. But this uncurling issue is quite big because I have to literally clamp my lashes to make them stay somewhat curvy, which beats the whole point of "oh, non-wp mascaras are gentler on your lashes". If other L'Oreal mascara smudge on you, yeah, probably you're right. I think it is the same hydro-fudge formula for most of them.